inscription: Just below large drawing of mans head is: "Glad Day Press / Union / Shop" with an IWW logo and "I.U. / 450 / 308 Steart Ave., Ithaca, N.Y. 14580". Poster is printed on white paper with text and images in red, green, black, and brown. The top of the poster has text in black: "America has more prisons, / and prisoners, than any / other country in the world. / Why???" with a stylized drawing of a prison wall with several watchtowers, red blood is drawn dripping from the bottom edge of the prison wall. The top of the poster also has a stylized drawing of the head of a male figure with glasses, the man's hair is overlaid with a drawing of a figure rendered in brown kneeling and shackled to a black drawing of the African continent. Below these drawings is more text in black: "Prisons are Big Business / The Prison Industry is / The third largest / Industry in America.". The lower left corner of the poster has a red background with a stylized drawing of the United States of America which is colored with green crosshatching and overlaid with drawings of two male and one female figure. 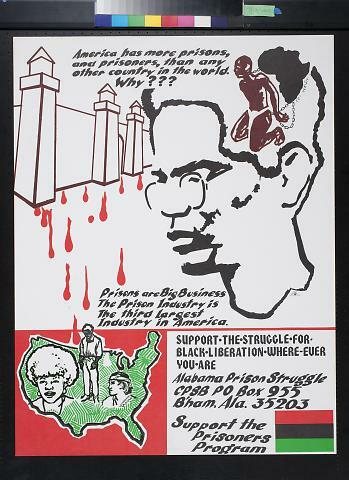 The lower right corner has a white background with text in black: "Support - The - Struggle - For - Black - Liberation - Where - Ever / You - Are / Alabama Prison Struggle / CPSB PO Box 955 / B'ham, Ala. 35203 / Support the / Prisoners / Program" with the red , black, and green Pan-African flag.